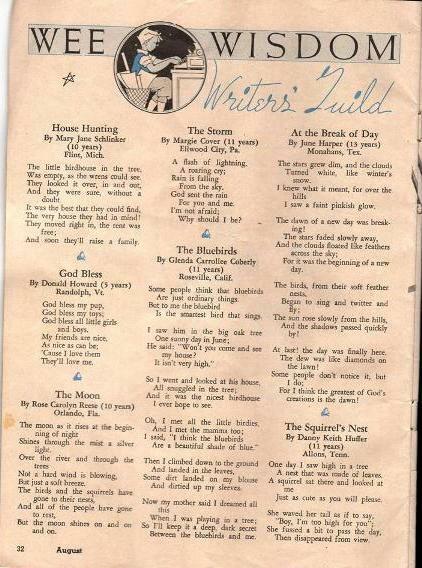 Among my files I found one of my poems that I wrote when I was probably in about the 7th grade. 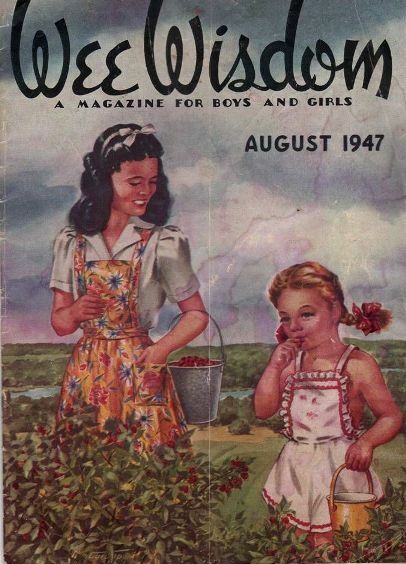 It was published in Wee Wisdom Magazine (long since gone out of print but it was a big deal in 1946 and 1947 with world wide coverage…I made contacts from all over the world right after the war…people wrote me letters as my name was on their penpal list.) You never know what I might find in my files! The story of how Jr. High and High School collected and sent huge boxes overseas as a result of some of the letters I received…sad stories of their great needs and suffering…from war torn countries in Europe. My letters were read aloud in some of the assembly programs and the faculty and kids all voted to collect things, box them and sent them to various countries…we sent a lot to England, Greece and Germany. If this would make an interesting story I could write it up for you. There are probably a few who still remember our efforts…Lonnie Smith for one…to alleviate the terrible suffering some of those folks endured. As the image did not come through on that attachment I just copied it and added it.